(MENAFN - DailyFX) Stock Market Talking Points: SPY, IVV, and VOO notched a combined outflow of $9.357 billion on January 25th, the largest intraday outflow ever Coupled with deadlocked fund flows in the final week of January, it could suggest the stock market rebound is losing steam See Q1'19 forecasts for the Dow , Dollar, Bitcoin and more with the DailyFX Trading Guides . As January Draws to a Close, so Too May the Stock Market Rebound The final week of January capped off an incredible month for US stock markets. In total, the S & P 500 gained 7.96% in the first month of the year while the Dow climbed 8.63%. The tech-heavy Nasdaq concluded the month 8.41% higher. Despite the remarkable rebound from the depths of December, exchange traded fund (ETF) flows reveal the comeback effort may be headed for a pause. 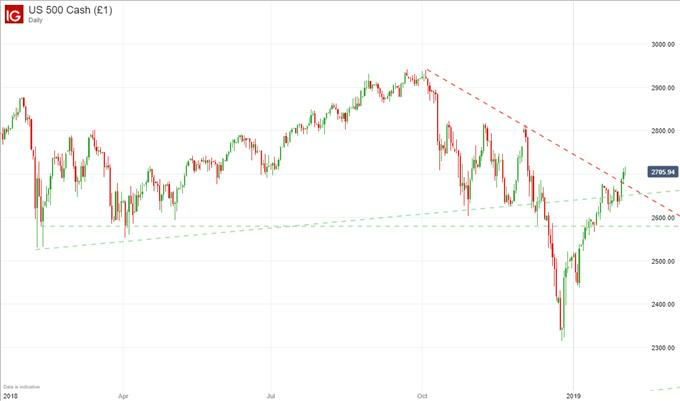 S & P 500 Price Chart: Daily Timeframe (January 2018 to February 2019 (Chart 1) Learn to day trade the S & P 500. According to fund flows from SPY, IVV and VOO, January 25th saw the largest single day outflow from the aggregated funds in my records. While the nearly $9.5 billion dragged out of the funds is remarkable, it is worth noting the relatively short lifespan of my fund flow records. Aggregate Fund Flows for Broad Market ETFs versus S & P 500 Performance (Chart 2) With that said, I expanded the historical data to include fund flows over the last ten years. Surprisingly, the combined outflows of SPY, IVV and VOO on January 25th marks the largest intraday outflow for the three funds ever but was not record-worthy on an individual basis. When observed in the context of the broader market, the outflows are particularly interesting. January 25th saw the S & P 500 gain 22 points and close the week slightly higher than it opened. To top it off, the outflows came amid the robust January rally. In conjunction with the minor outflows from the week ending February 1st, the fund flows suggest bulls may be tiring while other investors look to call the top and move their capital elsewhere. DailyFX forecasts on a variety of currencies such as the US Dollar or the Euro are available from the DailyFX Trading Guides page. If you're looking to improve your trading approach, check out Traits of Successful Traders. And if you're looking for an introductory primer to the Forex market, check out our New to FX Guide.